In the first part of the lesson we revised ‘Giving Updates’ which we had done previously from Business Result Upper Intermediate. I gave them cards with Key Expressions on , and they had to put the cards into categories like ‘Asking for Information’ and so on. After this, I answered any questions about the meaning and use of the phrases. 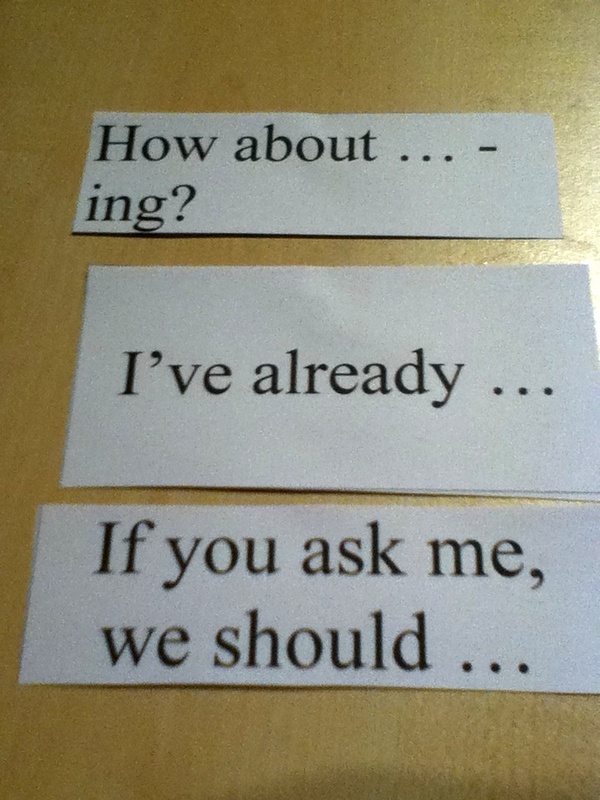 Then we did a Speaking Test from the Teacher’s book which practised these key phrases. The excellent Teaching Resources site of Oxford University Press is here (sign up required for downloads). Please note, I’m not against using great resources, I just think that habitual coursebook use lowers the learner’s ability to direct their own learning. Next, there was a task based on a suggestion from the learners – ‘Inventing a product’. I had the idea of inventing a new children’s toy (or game) for a failing toy manufacter. Two members of the group also have small children so I thought this might be an interesting topic. Originally I had intended to divide the group into two, and have one group make design the toy, and the other market the toy – then the two teams would re-use the ‘Giving Updates’ target language for a progress meeting between the two teams. But only four learners turned up! As my original idea really wasn’t practical, I decided that both teams would make a prototype as this would also add an element of competition which this group enjoys. The task involved both teams first brainstorming, designing and then making a prototype toy. How does this relate to their everyday work? Well, the company they work for is a business ‘incubator’ – they support and assist new businesses to become profitable, so working with new business ideas is a central part of their work. 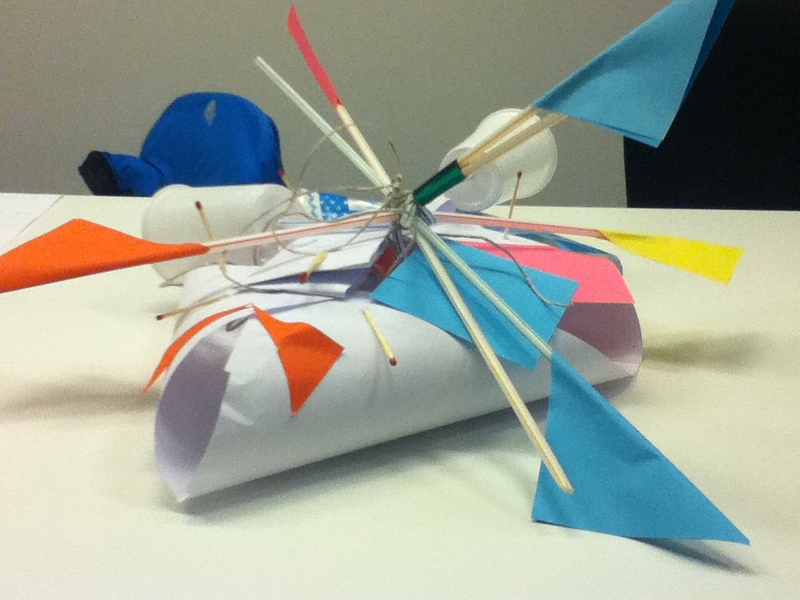 Team A decided on a hedgehog toy using quality materials. The target market was to be middle-class, environmentally aware parents. Team B decided on a learning ‘cube’ or puzzle for small children, which gave away a sweet when the children solved the puzzle! This was to appeal to both small children and parents who wanted to ‘train’ their children to learn effectively. Both groups first had to design their product and present a rationale for why it would sell and who it would appeal to , before getting their materials. Below are the materials they could use, and I gave them 25 to 30 minutes to build their prototypes. As is often the case – the making then proceeded furiously! Both teams enjoyed working with the materials and trying to match their designs with the limited resources. It was interesting that no-one sat back and rethought their designs at this stage. A related problem was that both teams failed to build in any flexibility into their designs, or any alternative designs. They stuck to their original designs even after getting their materials – if they had changed their designs to incorporate the resources they had, the prototypes might have been better. In Team A it seemed like both team members were working in opposite directions at times. Did they allocate tasks effectively? Did they communicate and check understanding? Did they have evaluation points during the exercise? How well did they respond to time pressures? We also spoke about the broader issue of responding to the challenge of limited resources under time pressure, which is often what they face in our working lives. I’m actually a big fan of building, doing physical activites or moving around in class as I think this makes for a really dynamic learning enviroment. This all goes back to one of my educational heroes Maria Montessori who based her pedagogy on learning-by-doing, with the teacher playing a secondary role to the experience of the learner. 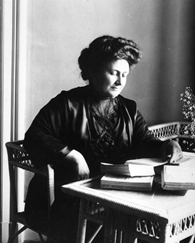 What is surprising is that her first book in English, The Montessori Method: Scientific Pedagogy as Applied to Child Education in the Children’s Houses, was published in 1912. Whether education, and specifically pedagogy has moved on since then is a big question! But excuse my tangent! Here are the two prototypes of the learners. If I had to do the lesson again, I would of course like to have more people! 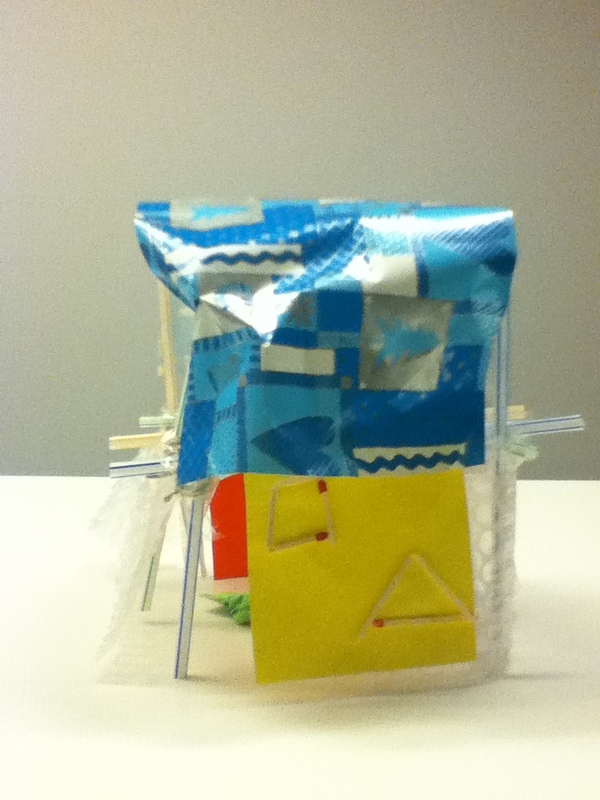 But I also think the learners needed some more support during the brainstorming and designing stages (pre-making). Instead of a pre-made worksheet setting out a kind of ‘role-play’ situation I would first bring in a few real toys and get the learners to think about why these are effective, or best-selling toys. Or I might get the learners to go to a website (like the early learning centre here) and pick out toys which they think are good and explain why. What I liked about the lesson is that it was fun for the learners, they spoke only in English during the task and it involved some real-world practice of working together under time pressure with limited resources, which is an approximation of their working lives. How Decentralised this lesson was is debatable. The first revision exercise was from the previous coursebook, as learners had asked for revision of Useful Phrases, and here we did ‘Giving Updates’. 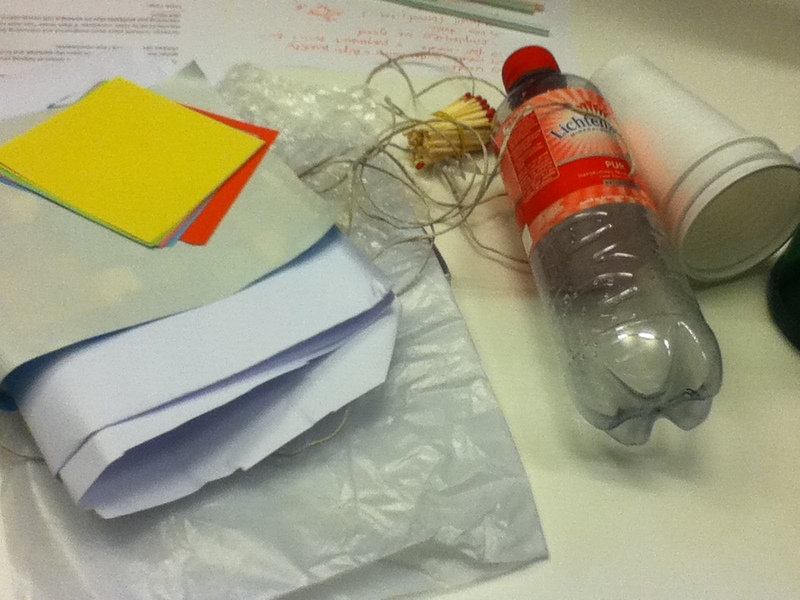 The task activity was also chosen by learners, but I provided the framework and the materials for the activity. So, all in all this was perhaps a good balance between Decentralisation and Centralisation. Let me know your thoughts! This entry was posted on November 4, 2013 by paulwalsh in DCT in action, For Teachers and tagged autonomy, Change, coursebooks, Decentralised Teaching, Decentralized Teaching, design, Giving updates, group work, Inventing a product, Learner Autonomy, learners, learning, maria montessori, prototype, task, Task based Teaching, toy.